I know this happens to everybody. You turn around and suddenly there are babies everywhere. We've had two new ones in the Vancouver family this year and one of my best pals from my Whistler days had a wee babe last month. (Wait, that was two months ago. Oh crap, I'm further behind than I thought.) I had the best of intentions to make goodies for all these lil' chickens, I really did. I wanted to knit a Baby Surprise Jacket. I wanted to knit a second Saartje bootee. I wanted to finish up that quilt I started 80 million years ago. Eh, what can I say. I didn't get any of those things done. Instead, I capitalized on my friend's genius and bought from Soto Softies. If you're not familiar with Maritza's work, you should really check it out. Impeccable detailing, great colour choices and dood, teh supercute! If you're so inclined, she also just listed the pattern for a penguin softie. 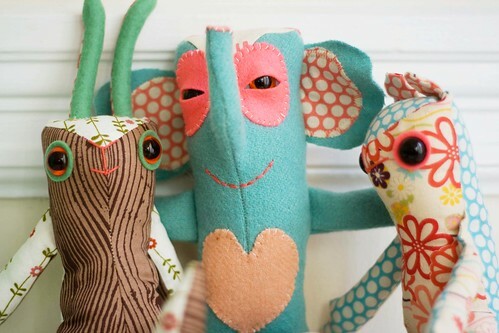 You can make your own adorable Soto Softie original. See? She's genius. I want to start making one right the eff now, but I'm flying to Vancouver tomorrow, my sewing machine is in for a tune up and hello!? Would I really get it finished before Christmas? No. No, I would not. But look out Penguin, you're first on my list of stuff to make as soon as I get home because I know I'm going to turn around again and someone else will be having a baby. There are babes being born all around me these days too. I've got a half finished BSJ that was for my cousin's baby born last summer. I'm pretty sure it will be much too small for him at this point. Luckily I know two more baby boys due shortly. Maritza's softies are brilliant. We own two. Thanks for the heads up on the pattern. I didn't know about that. Ha--Penguin is the first thing on my post-Christmas list now too! ugh, i love babies and i love my friends and family, but dear god, i cannot take anymore weddings or pregnancies!!! it's making my biological clock tick so loud, i feel like captain hook. Maritza is such a color maven, thanks for pointing us in her direction once again! I just pulled out my Pedro the Penguin from last year. Makes me feel very Christmasy!!! Those are so great! Thanks for sharing a good source. Hope you are doing well Caro!